Most amateur musicians play in major, as the majority of popular songs in our culture are in major. However, when we are learning music, because we naturally learn by comparison, we must have at least one ﻿other﻿ tonality to compare major to. However, there is general confusion amongst most beginning musicians about what a tonality actually is. A song, for example, like "Shady Grove" has a minor tonic chord, and in communicating with other musicians, one simple might refer to it as a "minor song." Music Learning Theory seeks to abate that confusion by bringing clarity to the﻿﻿﻿ ﻿﻿﻿definition of a tonality. 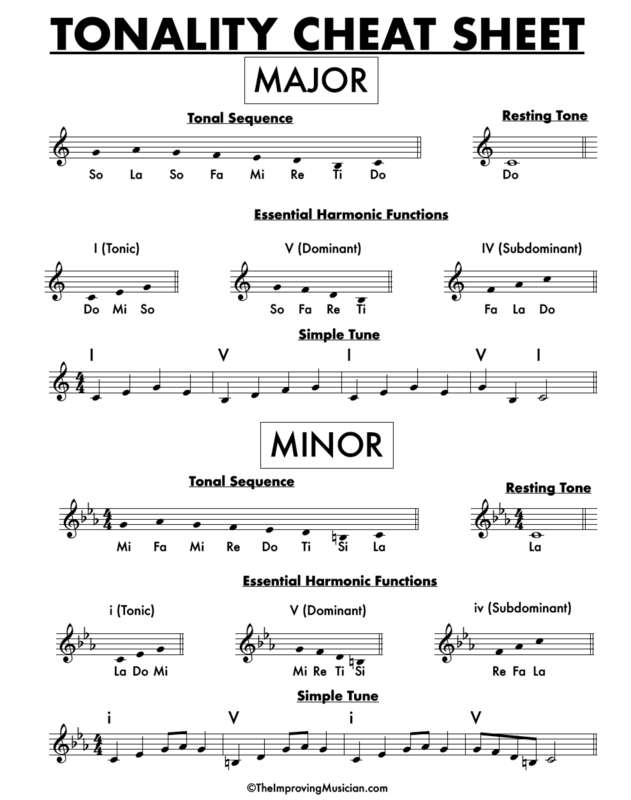 Music Learning Theory classifies and ﻿organizes﻿ the tonalities in relation to their resting tone. To achieve this, we employ a system of verbal association using tonal solfege. So, if you are audiating DO as the resting tone, you are in the tonality of Major (referred to by music theorists as the﻿ ﻿Ionian mode). If you are audiating RE as the resting tone, you are in the tonality of Dorian. And so on. Download the Tonality Cheat Sheet here! Musicians who continue to further their studies, perhaps in investigating methods and techniques on how to take a solo, might come﻿ ﻿across the tonalities above as modes. Someone might explain the modes to someone like this: If you play the white notes on the piano from C to C, that’s Ionian. If you play from D to D, that’s Dorian. If you play from E to E, that’s Phrygian. And while that is true, and is a perfectly fine way to hear the modes, it really is missing the point. Instead of looking at the modes as scales, it is more beneficial to our musicianship to regard each of the modes as tonal centers, as tonalities. If, then, we begin to think about each of the tonalities as tonal centers, rather than as an obscure scale we use only in Jazz improvisation, we will realize that there are characteristic chords - harmonic functions - that ﻿accompany﻿ each tonality. These chords ground us in each tonality. In keeping with the Whole-Part-Whole philosophy, below are short, repetitive songs in each of the tonalities. These eTunes contain the ﻿primary﻿ harmonic functions and characteristic tones of each tonality. Consider these the first "Whole." Listen to these eTunes many times to get the sound of each tonality into your audiation. All 8 eTunes are available in mp3﻿ ﻿form. These are great for car or treadmill listening.